The six-day waxing gibbous moon is visible for many hours in the evening – perfect for lunar observing and sketching. 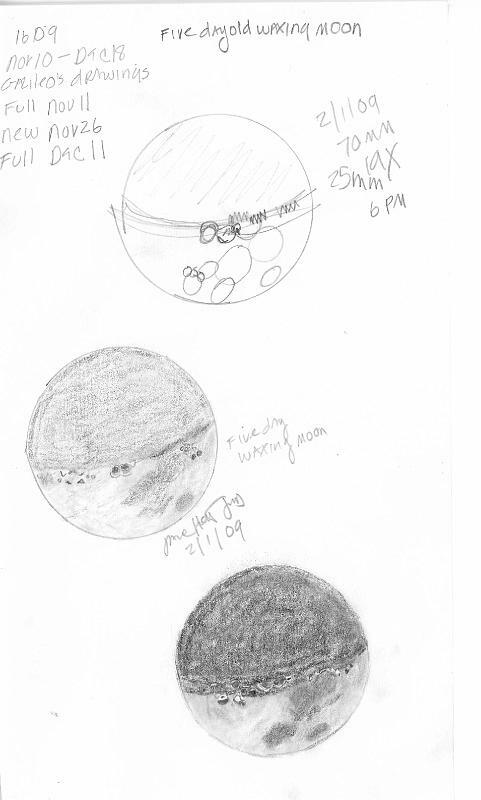 The time of my sketch was closer to the sixth day than the five day old moon. I had a hard time identifying craters using either lunar days! Note how much fainter Mare Crisium is now than on the three-day moon. Many of the features barely visible three lunar days earlier in earthshine are now lit. On the terminator, beginning on the right and moving to the left, I see Aristoteles and Eudoxus and sketched them as dark splotches. Montes Caucasus, the Caucasus Mountains, show as a half-circle of sunlit peaks on the terminator, cradling the Sea of Serenity. Hmmm, should I use the Latin names or the English names? A bit of both, so the more familiar names are understandable, I think. Closer to the center of the terminator, I can see Plinius, a bright white crater within the Sea of Tranquility. The Apollo 11 landing site, though not visible is just on the left edge of the Sea of Tranquility, the left-most of the two large seas touching the terminator. The large sea closer to the lower edge is Mare Fecundidatis, the Sea of Fertility. Moving back up to the lunar terminator are a pair of lit craters. They are Hipparchus and the small crater Horrocks (connected at right) and Albategnius. These are the two craters where the sunrise is just touching the crater walls a little more than halfway from the middle of the terminator. Moving along the terminator, the final 2 features I can identify (at 19x) are Gemma Frisius and Maurolycus, the last two craters on the sunlit side of the terminator on the left. I suspect the sunlit crater walls just on the unlit side of the terminator belong to the craters Walter and Purbach (to the right). Hitchhikers’s Guide to the moon. Select Feb. 1 or 2, 2009 to match my sketches.